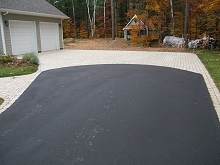 The driveway is not only the first landscape feature to make an impression on people as they approach a property for the first time, but it is also one of the most functional pieces for the homeowner. 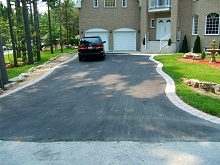 A well designed driveway will accentuate and compliment the facade of a house, and also allow easy access for vehicles. Furthermore, if properly engineered, it will easily bear the weight of heavier vehicles without sinking and be resistant to the freeze/thaw cycle. 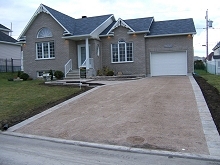 Uni-stone driveways add style, elegance, and value to a home. There are many different styles and colours to chose from, and the possibilities for look, texture, and pattern are almost endless. 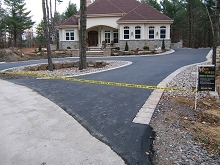 If finishing the whole driveway in uni-stone is not an option, clients often opt for a combination driveway of uni-stone and asphalt. 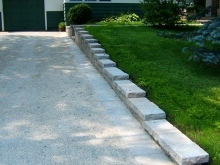 In these cases a border of uni-stone is installed on the sides of the driveway, and there is the option of adding some more stone at the foot of the garage. 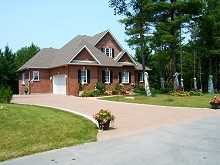 If a more country-style look is desired, than the use of stabilized decorative crushed stone should be considered. This material comes in a large selection of colours, and due to its stabilizing agent and high compactability, greatly reduces many of the drawbacks associated with traditional pebble stone driveways, such as car ruts and weed growth.